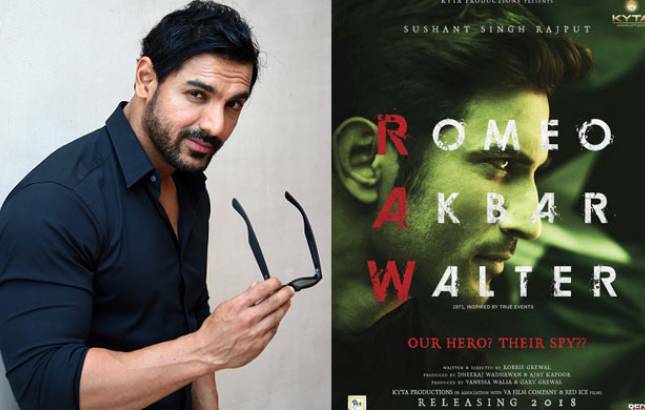 John Abraham, who has impressed the audience with his action-packed movie Force 2, is all set to hit the screens with the same avatar in his next project Romeo Akbar Walter. According to the media reports, the Dhoom actor has replaced Sushant Singh Rajput as the main lead on RAW which is being helmed by Robbie Grewal. While the makers are quite elated to have John on board for the movie, there are speculations about why SSR was replaced as the lead actor, given the fact that Sushant had even released the first poster of RAW last year. It was also reported that the team had even shot a major portion of the movie before Sushant chose to walk out of Romeo Akbar Walter. "We are excited to have John on board this film with us. The process began when we were brainstorming on whom to cast for the protagonist’s part and thought that John would fit the bill perfectly. He really liked the script and gave his nod on the same day as the narration. We have revisited the script of this espionage-drama which is set in the 1970s and we can’t wait to take it on the floors," Ajay added. Romeo Akbar Walter is likely to hit the floors on June 1 and is likely to be wrapped up within 60 days.